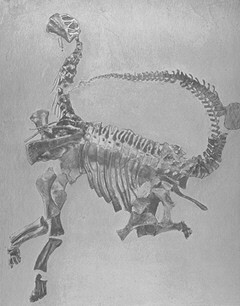 After the American Museum of Natural History acquired Edward Cope's fossil collection in 1902, Henry F. Osborn and Charles C. Mook published a detailed study of one of the sauropods - Camarasaurus - in 1921. A year later, in 1922, a fully articulated and almost complete skeleton of a juvenile Camarasaurus was found in the Carnegie Quarry, Utah ( shortly destined to become the Dinosaur National Monument). This slab of rock is still the most perfect sauropod skeleton ever discovered. The Carnegie Museum decided to display the skeleton as a panel mount. Charles W. Gilmore described this specimen in 1925, concluding that Camarasaurus stood highest at the hips - not the shoulders as had been hitherto described by Osborn and Mook - similar to Apatosaurus and Diplodocus.